You will need to discuss it with your husband about fresh meals, dusting, cleaning, dishes and moving the lawn among other jobs around the house. You will need to divide it between both of you so that each one knows his or her chores to do. Somethings you might not like and there might be others that he hates. Ensure that each of you gets to do chores that you or he can tolerate. The ones that both of you detest, alternate it every week so it is not solely yours or his responsibility. If you have extra money, hire someone to do it! Share expectations and don’t be pushy with each other. Some like to work early mornings while others prefer doing it at night. Just ensure that the chore is done as per choice of the timing. 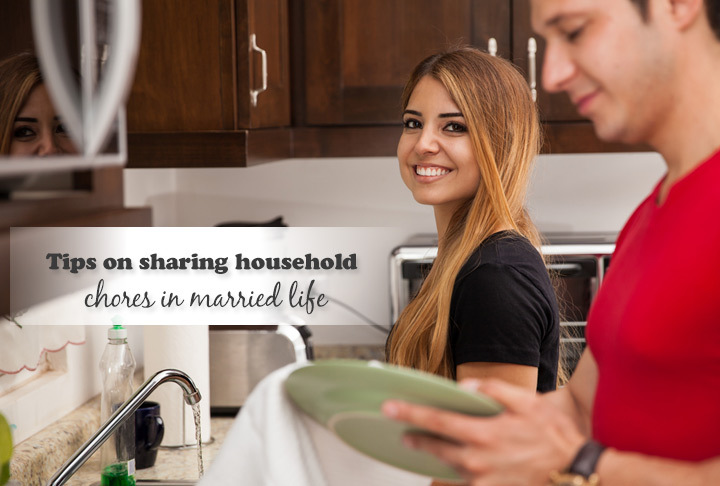 You or your spouse might have a busy next week and based on that create list so that chores are covered. You might do less the week you are busy or take on more chores later one. However, discuss, plan and then stick to it to ensure that the household runs seamlessly. Sharing and working ensures that both of you have ample time to spend together doing things that you like. And if you can afford it, hire someone to do a few chores so both of you can relax over the weekends.